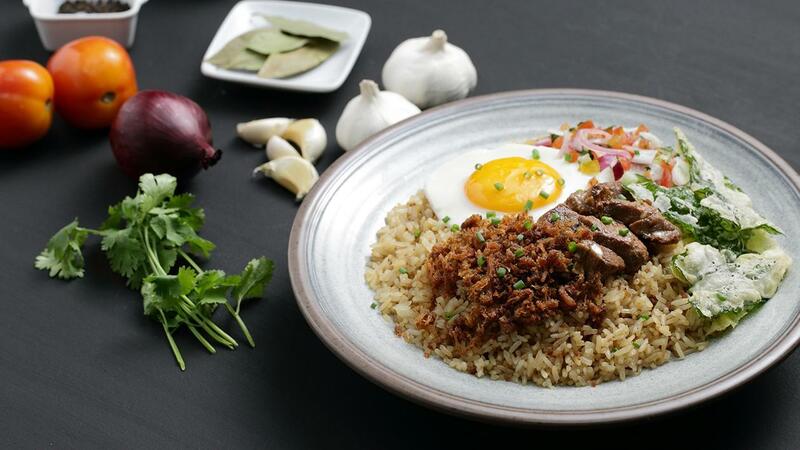 Discover a different and fun take on the traditional Pinoy dish, Adobo! Knorr Liquid Seasoning and half of the vinegar. Heat oil in a sauce pan.Brown the pork on a all sides.Set the pork aside until ready to use.Remove the pan and drain out the oil. Add the garlic cloves.Add the pork.Deglaze with the remaining marinade. Add enough water to cover the pork. Add the bayleaves and the black peppercorn.Braise the pork until it is tender and cooked through. When the pork is done, taste and adjust seasoning. Add the brown sugar to balance the taste. Separate the cooked pork from the sauce. Using a fork, flake the pork. Portion the flaked pork into 50g packs and the sauce to30ml. Store the portion packs in the chiller or freezer. In a mixing bowl, season the rice with Knorr Rostip Seasoning Powder. Toss the rice the powder with your hands making sure that everything is already well seasoned. Add the butter, then the garlic. Add the rice. Toss the rice in the pan, making sure it is heated through. Set the rice aside. Using the same wok, add the adobo flakes along with the sauce in the pack. Let it heat through. Then add the rice to the wok. Toss to mix the ingredients evenly. Season with Knorr Liquid Seasoing. Taste and adjust seasoning. Keep warm in a bowl, set aside until ready to plate. To plate, place in the rice in the centre of a plate and top with the fried egg. Arrange the crispy adobo flakes,tomato salsa and the crispy kangkong around the rice.